Earlier this week, I tried this Korean restaurant in Lippo Mall Kemang, Jakarta Indonesia, named MUJIGAE. Not a new restaurant, but I don’t know why it took me awhile to try this casual Korean Food Restaurant. But then, my son tried it first with his friends, and he said it was delicious, so there I went. 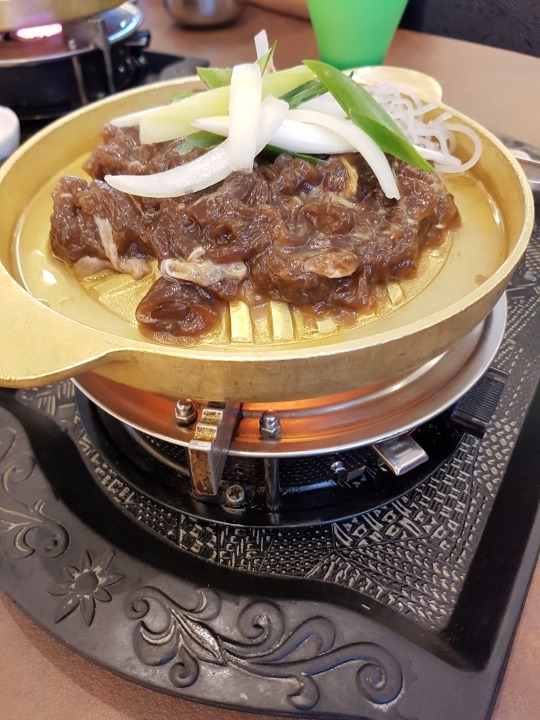 There are several Korean restaurants in my neighbourhood, but I must say this Mujigae has the best yet super affordable barbecue beef. I went with my son and hubby, so there were three of us and we only spent less than IDR 300K including drinks. Bring cash, because they don’t accept credit cards yet. Other than the barbecue beef, we also ordered Bulgogi (shown above). It was a successful dish also, considering they sliced the beef thinly and very well marinated (the meat there is very tender & tasteful). Different from the beef barbecue which you have to put on the pan slice by slice, the Bulgogi’s meat are already on the pan. Comes with the DIY mini grill pan (how cute, right? ), the con is: when the fire is too big, watch out for the splattered oil and overcooked beef. By the way, our barbecue beef and bulgogi come with kimchi and nori sheets too. For drinks, try their Mango Yakult (very refreshing!). Recommended? Hell, yeah. I’ll be back for sure.